The following article was written by Dean and published in the November 18, 2011 issue of Sports Collectors Digest. While 1952 Topps card set stole the spotlight for that particular year, the 1952 Bowman card set was anything but boring. It was simply overshadowed by the grandeur of the 1952 Topps issue. Bowman continued to slowly and steadily improve their product offering each year and 1952 was no exception. 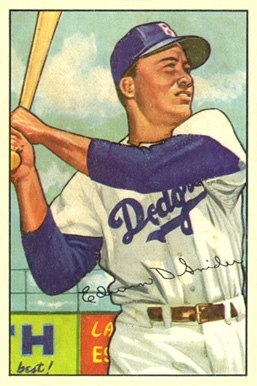 While Bowman scaled back the number of cards in their 1952 set to 252 (their 1951 set featured 324 cards), the card size remained the same: 2 1/16” by 3 1/8”. The card fronts feature color player drawings, rendered by artists from black and white player photos. The main change that Bowman made from the previous year, was removing the black box on the card front that contained the player’s name. Overtop the player drawings are facsimile autographs, a design detail that Topps employed that very same year. The 1952 Bowman are more attractive than the 1951 cards, but identifying a player from his signature can be a bit tricky on some of the cards, forcing a collector to consult the card’s back for identification. The simple card backs feature player statistics and an advertisement for the Bowman Gum Company, a first for the company since 1949. The 1952 Bowman low number cards, cards 1-216, are very affordable and therefore more collectable than the 1952 Topps cards. However, the high number series of cards from 217-252 cost on average four times as much as the low numbers. Conversely, a 1952 Bowman high number common card will cost you virtually the same as a low number Topps common card from the same year. All in all, the 1952 Bowman baseball card set is a nice set to own and is much more affordable than the 1952 Topps set. A collector can purchase an entire 1952 Bowman complete set for the price of a low/mid grade 1952 Topps Mantle.